We love this Maroon Tie Maxi Dress with Open Back! Be the center of attention with this stunning dress! This is not just one dress, the tie back top can be turned into many different styles. Approx. 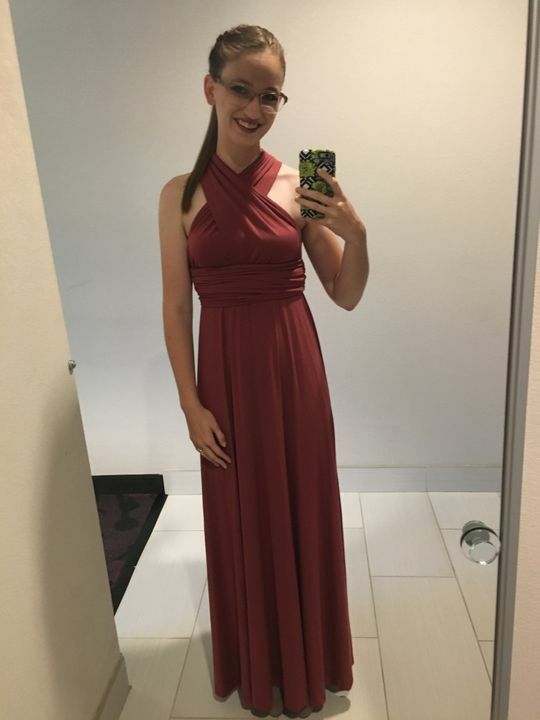 Length: -Small: 61.5" -Medium: 62" -Large: 62.5"
I bought this dress for a wedding and it’s the first dress I’ve ever bought online that I LOVED. The material was wonderfully soft and flowy and I couldn’t have been happier! I mainly ordered this dress because I've seen them everywhere with so many options on how to do the top. As soon as I received my order I instantly started trying different styles! You could use this dress for everything! I cannot wait to use this at a wedding I have coming up! Only downfall for me is it is super long, but could be an easy fix with minimal alterations. So comfortable and flowy. The fabric is thin but so soft. Received many compliments. There is so much you can do with the straps. It really changes the way the dress looks. Fit perfect!! Such a pretty color! I'm 5'11 and its long enough, another reason why I love this site so much!